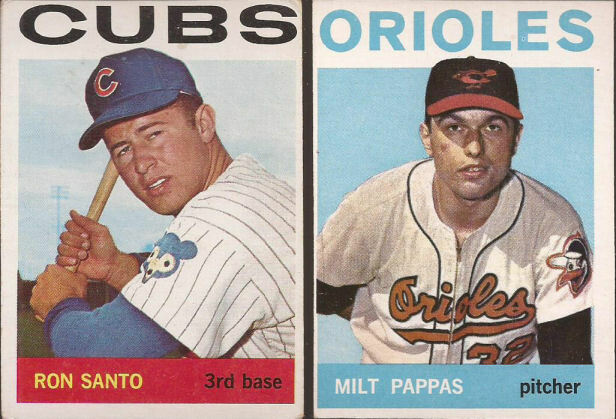 It would be an understatement to say my 1964 Topps build is mired in the muck. I'm just over the 70% mark, but still missing some of the biggest cards. There are still plenty of commons needed as well. I haven't been able to get to the Orland show and see if my cheap vintage guy has any more commons for my build. Thankfully, CommishBob from Five Tool Collector must have his own access to 64s, as a little more than a dozen cards in a PWE. Quite fine shape, so let's take a look at a few. Nice looks at some classic uniforms, with the KC vests and the under sleeves with TV numbers. A definite rarity to have numbers on the sleeves in MLB. The Phillies currently have a number on one sleeve. Lynch is sporting a flocked batting helmet. 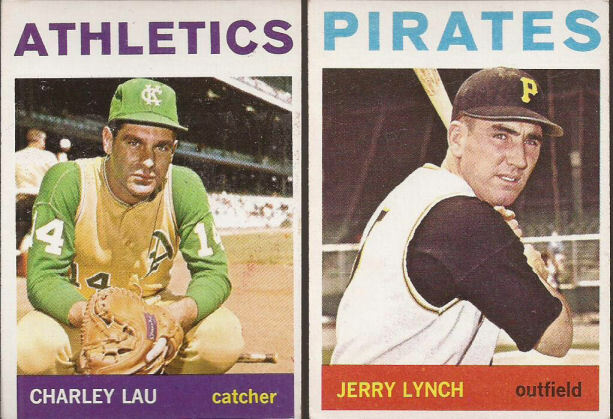 A few teams have gone to matte helmets in the past couple years, but I would love to see the Buccos go full fuzzy for a 60's throwback uniform. A catcher with no gear. For the record, Haller was a Giant the previous year, so that cap is not blacked out. Zoilo laying one down. I think I have a copy of this in my bunting binder. Actually, I don't. Bummer. Perranoski is in an interesting pose. Not sure if that angle is reminiscent of his pitching motion, though. Santo was the biggest name of the bunch and a great addition. This card would cost me a pretty penny in this area. I hope you got a great deal, Bob. Milt sticks in my head around Chicago for the many times I heard him on the radio complaining he was robbed of a perfect game by Bruce Froemming. I really hope he just used the game for fun and ribbing, but it really seems like Milt just couldn't let it go. I already have this card in the build, and I'm certain Bob knew that. This is a sweet miscut for the binder. Well, I am now at 71% of the set build. Maybe I can get over 90% by the end of the year. Good looking ads from the Commish! 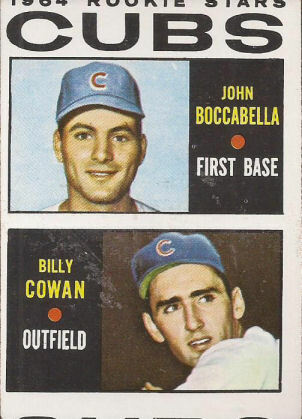 I got these from the same guy I bought the '58 Mantle from. He pretty much let me have them for nothing after I opened a vein for The Mick. Oh, and if you think Pappas was whiny on the radio you ought to try reading his book. Oy vey!